I think we’ve all been there. We have been exercising and watching what we eat, but the weight won’t budge and it’s extremely frustrating. You might even be entering the “what’s the point of all this exercise and healthy eating when nothing is happening?” state of mind. But before you let your frustration get the better of you and derail your new healthy lifestyle, take a deep breath, relax, and let’s talk this through together. The first question to ask yourself is this: how long have you actually been following your new lifestyle? Has it been a few days, or maybe 2 weeks? Most of us respond really well to instant gratification, so we step on the scale on day 2 of our diet in the hopes of seeing weight loss and get disappointed it hasn’t happened. The thing is, even if you saw a drop on day 2, the weight loss would probably just be down to water weight. You won’t see any significant fat loss happen that quickly. My recommendation is to diligently follow your plan for 3-4 weeks. If you haven’t seen the expected results at that point, make rational changes. I know that it can be hard to keep your motivation up for that long if you’re not seeing results, but it’s not uncommon for the numbers on the scale to stay the same or even go up for the first 2 weeks of a new diet. This can happen for a number of reasons, but the most common reason is that you are eating more veggies and “real” food, which stays in your digestive system for longer and binds more water than processed foods. So even if you are losing body fat, your total weight stays the same (which isn’t a bad thing!). Are you measuring your food accurately? The next question would be whether you have been measuring and tracking your food and calorie-heavy beverages accurately. If you have just been winging it or guessing what and how much you’re eating, you can’t know if your plan is working because you don’t really know if you are following the plan. To see if a plan is working, you need to actually implement it accurately and be consistent. That doesn’t mean eating the same thing all the time, but a good starting point is to at least track your calories. Optimally, you would also track your macronutrients (protein, carbs, and fats). It can become quite tedious to do with pen and paper, so I recommend using an app like MyFitnessPal for tracking. Have you adjusted your diabetes management? The third question you should ask yourself is about your diabetes management. 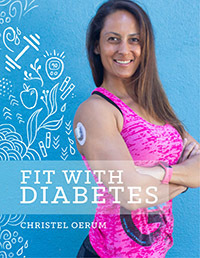 As you have added exercise and changed your eating patterns, have you also adjusted your diabetes management? Adjusting your diabetes management to a new diet and exercise routine can be challenging, but it’s an essential part of weight management. If you’re constantly experiencing low blood sugars, it’s going to be extremely difficult to achieve the results you are hoping for. I’ve mentioned the concept of “feeding the insulin” before, and if you’re running low all the time you’re doing just that. What I mean by this is that you are taking more insulin than you actually need and keep “feeding” it with carbs to keep your blood sugar from crashing. Those extra carbs are not needed, and your insulin regimen should be adjusted to match your new lifestyle. The fourth and final (for now) question comes down to your weight management journey. And it really is just that – a journey. It needs to be both sustainable and yield the results you are looking for in a healthy manner. So, unless you are obese, don’t try to force a significant weekly weight loss. Make changes that will take you down the path of sustainable weight management. Are you pushing your body too hard in your rush to see results? Even exercise can be overdone. Excessive exercise can release stress hormones and mess with your hormonal balance, especially if you aren’t used to working out. This can lead to both inflammation and water retention. I recommend incorporating a minimum of one rest day a week. Listen to your body. If you start feeling permanently tired, it’s probably time for a rest day. Finally, if you have followed all of the advice above and still aren’t seeing results, you will have to make changes to your plan. Not random or emotionally driven changes, but rational changes. I would start by changing your diet since that is the most important factor for weight management. The calorie calculator might have recommended a 1600-calorie weight loss plan, but the calculator doesn’t know you and your specific needs, so it will always give a recommendation for the average person. But we can’t all be average. Let me use my own experience as an example. I’ve dieted on 1200 calories (awful, I would not recommend it) and on 1500 calories. And guess which plan I was successful with? The 1200 calorie plan did nothing for me, while my weight management got back on track with the 1500 calorie plan. Most significantly, the macronutrient split was very different in the two plans, and my body just responded better to the split in the 1500 calorie plan. Not only was I getting more calories (needed for my activity level), but I was also getting the right kind of calories. I can’t tell you exactly what calorie level and macronutrient split is best for you, but I would suggest you start by playing around with your macros before changing your calories. Try to eat less (or more!) carbs for a week, and see how that affects your weight and diabetes management. It really is a long-term science project to find your personal weight management formula, but it can be done! 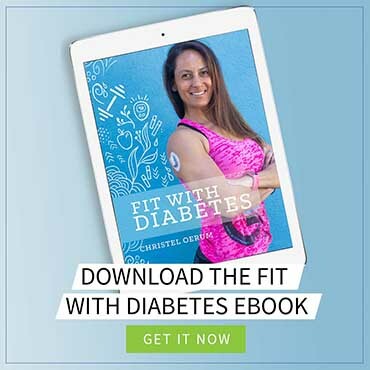 For more information about weight loss, I strongly suggest reading the post “How to Lose Weight with Diabetes.” It’s a very detailed guide to everything you need to know about diabetes and weight loss. I have a question about a “rest day”. Does that mean total rest? Or just rest from strenuous gym – day type exercise? Is it ok to get my 10k steps with walking on the rest days? I’m trying to hit the gym hard 3 to 4 days a week ( weights then cardio) but just get steps in on the other days. Could definitely be a water retention thing too!! Our weights fluctuate on the daily depending on how much sodium we’ve taken in! I know for me – even though I do not weigh myself – if I were to eat say, sushi, one night… The next day, yeah, I will most likely be at least 3 pounds heavier thanks to the water retention! haah! Yes very true! Salt intake is often an issue in feeling like you gained fat. Also if a person has alergies to dairy or gluten for example you can feel very bloated which also can make one feel they are not getting anywhere. Cutting out these foods for a while to see if this makes a difference can help.